As we’ve discussed elsewhere (in the sections on thioesters and fatty acid metabolism fatty acid metabolism) acetyl-CoA is a very central molecule in metabolism. Acetyl-CoA is a very central molecule in metabolism and is produced during the metabolism of sugars, alkanes, fatty acids and some amino acids like leucine. Indeed, after glucose is metabolized to pyruvate through glycolysis acetyl-CoA is made from pyruvate and CoA by a very large enzyme called the pyruvate dehydrogenase complex. We will not go into detail about this complex enzyme here. Rather, we bring it up to highlight two important concepts. First, that oxidative decarboxylations are very favorable reactions, meaning that NADH can be produced by decarboxylating acids like pyruvate. We will return to this theme as we discuss the TCA cycle below. Second, that acetyl-CoA is a major point of convergence in central metabolism, standing at the crossroads between the catabolism of glucose, amino acids and lipids. But how is acetyl-CoA itself metabolized? We can see that the net effect of the TCA cycle is to decarboxylate acetyl-CoA twice to make CO2 and 8 electrons. In the TCA cycle, electrons are mostly donated to NAD+ to form NADH. These electrons are subsequently donated to O2 in a manner that is coupled to the formation of ATP via the respiratory electron transport chain. You might think that the oxidation of acetyl-CoA would proceed directly. However, the direct decarboxylation of acetate would give CO2 and CH4 (methane) a reduced (electron-rich) one-carbon molecule that is very stable gas that is quite complex to metabolize (Lehninger Principles of Biochemistry, 2008). In fact, methanotrophs (organisms that consume methane) use very complex and sensitive enzymes to do so. The direct decarboxylation of acetyl-CoA poses similar problems. Biology solves this problem by using “scaffold” molecules - the acetyl group is first attached to another metabolite and only then does metabolism proceed by decarboxylation and oxidation. These scaffolds aid by “holding onto” the acetyl group and by providing a chemical environment that increases its reactivity (making it more straightforward to metabolize, Lehninger Principles of Biochemistry, 2008). We will approach the scaffold-based metabolism of acetyl-CoA through a sort of back door by reminding ourselves about transamination. Remember that many amino acids are made by transamination of an appropriate alpha-keto acid acceptor. For example, glutamate can be made transaminating a five carbon dicarboxylic acid called α-ketoglutarate (also known as 2-oxoglutarate). 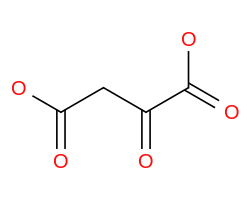 α-ketoglutarate or 2-oxoglutarate is called α-keto acid because it has a carbonyl group (ketone) adjacent to (in the α position relative to) a terminal carboxylic acid. Glutamate is a proteogenic amino acid in its own right, but also a precursor for the synthesis of several amino acids including glutamine, proline and arginine (Lehninger Principles of Biochemistry, 2008). Similarly, aspartate can be made by transamination of a four carbon dicarboxylic acid called oxaloacetate. Aspartate is a precursor for the production of asparagine, lysine, arginine, methionine, threonine and isoleucine (Lehninger Principles of Biochemistry, 2008). 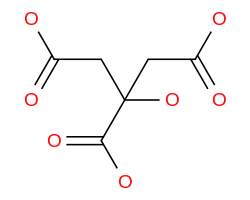 Oxaloacetate is a four carbon dicarboxylic acid that can be transaminated to form aspartate. 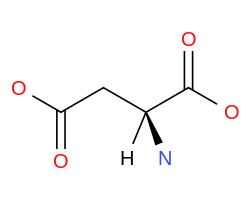 Aspartate is made by transamination of oxaloacetate - notice how the only difference between the two is the amino group. In order to make amino acids, therefore, cells need to make α-ketoglutarate and oxaloacetate continually. One way to think about the tricaboxylic acid cycle, then, is as means for metabolizing acetyl-CoA that uses these very central molecules, α-ketoglutarate and oxaloacetate, as scaffolds. We might imagine that these two very central molecules were already present in the cell at relatively high concentrations because they are necessary for amino acid synthesis, which is one potential explanation for why they are so central to acetyl-CoA metabolism. Notice that both α-ketoglutarate and oxaloacetate are absent from the net reaction because they are intermediates of the cycle - the scaffolds are neither created or destroyed in cycle, but rather serve as co-substrates for the metabolism of acetyl-CoA. The net effect of the TCA cycle is to decarboxylate acetyl-CoA twice to make CO2 and 8 electrons. 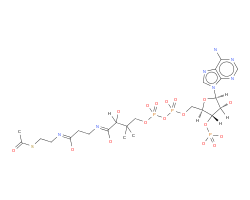 These electrons have an average potential of E’m ≈ -350 mV, meaning that they can be donated to NAD+ to form NADH (which has a more positive E’m ≈ -330 mV). You might notice that these E’m values are very close to each other (within 20 mV), meaning small variations in concentrations might make these redox reactions infeasible. Cells solve this problem in two ways. First, as we will see, only 6 of 8 electrons are donated to NADH. The other two e- are donated to a higher (more positive) potential acceptor FAD+ (E’m ≈ -240 mV). Second, the NAD+ and NADH concentrations are not exactly 1 mM. Typically [NAD+] is about 30-50 times greater than [NADH] - try using eQuilibrator to see how this concentration ratio affects the E’ value for NAD+ reduction to NADH. We are left with the task of building a cycle for the metabolism of acetyl-CoA to CO2 and electrons that uses the central amine acceptors α-ketoglutarate and oxaloacetate as scaffolds. We’ll do this by considering the two arms of this cycle - from α-ketoglutarate and oxaloacetate and back again. Let’s first consider what it would take to make oxaloacetate from α-ketoglutarate. Succinate has 4 carbons, like OAA, but is more reduced - having 4 more electrons. So it must be oxidized twice to make oxaloacetate. and a ΔrG’m ≈ 0. As discussed above, this almost infeasible ΔrG’m can be remedied by setting the NAD+ and NADH concentrations to more physiologically relevant values. For example, measurements in E. coli give [NAD+] ≈ 3 mM and [NADH] ≈ 0.08 mM. Try using these values to calculate ΔrG’ in eQuilibrator - does this help resolve the problem? First of all - it is important to note that the TCA cycle can’t possibly follow the same reaction scheme in both directions. If the TCA cycle used one reaction sequence from α-ketoglutarate to oxaloacetate and then the same sequence in the reverse direction to get back to α-ketoglutarate, this would be a closed cycle with nonzero flux  - a perpetual motion machine in violation of the first law of thermodynamics. Another, perhaps even simpler reason that the TCA cycle can’t use the same reaction sequence in the reverse direction is that we haven’t yet seen how acetyl-CoA is incorporated into the cycle. Acetyl-CoA needs to find it’s way into the cycle in order for the TCA cycle to metabolize acetyl-CoA, after all! which adds acetyl-CoA to oxaloacetate to form the tricarboxylic acid citrate (after which the cycle is named). Citrate is the a tricarboxylic acid after which the TCA cycle is named. From this we learn that the formation of a thioester on acetyl-CoA in the pyruvate dehydrogenase reaction above essentially “carries forward” the energy output oxidative decarboxylation into the citrate synthase step. Yet another example of an intrinsically unfavorable chemical reaction that biology enables through clever energetic activation. and is quite favorable with a ΔrG’m ≈ -40 kJ/mol. Putting together the two arms of the TCA cycle, we see that acetyl-CoA is added to oxaloacetate, oxidatively decarboxylated once to α-ketoglutarate, which is subsequently oxidatively decarboxylated once and oxidized twice to remake oxaloacetate. 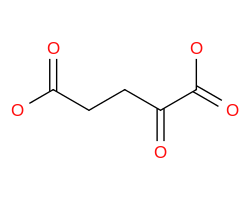 The two decarboxylations and 4 reduced electron carriers formed (3 NADH and 1 FADH2) account for the 2 carbons and 8 e- introduced to the cycle by the acetyl group of acetyl-CoA. The TCA cycle and anaplerotic reactions. Red titles denote the abbreviated names of the enzymes catalyzing the labeled reaction in E. coli. The enzyme that catalyzes this reaction, succinyl-CoA synthetase, is unfortunately named for the reverse direction of the reaction. By nonzero flux we mean that the cycle moves in a particular direction. For example the cell presumably “wants” the cycle to move in the direction of acetyl-CoA metabolism and energy production. In equilibrium the forward and reverse fluxes are definitionally equal and the cycle carries no net flux (forward - reverse = 0), meaning (in this case) that acetyl-CoA is neither created or destroyed by the cycle. However if we assume there is some acetyl-CoA degradation happening through the TCA cycle it must therefore carry net flux and not be in equilibrium. Above we implied that using P and P’ (a pathway P and its reverse) for both arms of the TCA cycle would imply that we are in equilibrium (because the concentrations of all pathway intermediates are the same in both arms). But if we are in equilibrium there cannot be any net flux. replenishes oxaloacetate from pyruvate. Notice that this actually replenishes all the TCA cycle intermediates, including α-KG, because oxaloacetate will be quickly converted into those metabolites through the action of the TCA cycle. In fact, there is no anaplerotic reaction that directly produces α-KG - cells rely on the TCA cycle to do this for them. In technical terms we would say that this configuration - where transamination happens at a constant nonzero rate but cycle intermediates are not replenished - has no nonzero “steady-state”. By this we mean that there is no way to arrange this system where the flux through the TCA cycle is greater than 0 for an extended period of time. Try to convince yourself of this. this reaction is problematic for two reasons. First of all, it is not very favorable, having a ΔrG’m ≈ +30 kJ/mol at pH 7. Using more plausible concentrations for [NAD+] ≈ 3 mM and [NADH] ≈ 0.08 mM helps but not enough to make the forward direction favorable (try this for yourself). Moreover, malate and oxaloacetate have different pKas on their two carboxylic acid groups, meaning that ΔrG’ of the malate dehydrogenase reaction will depend on the pH. Try using the pH slider and pH graphing utility on eQuilibrator to see how ΔrG’ and ΔrG’° depend on the pH. The pKa of an acid is the pH at which that acidic group is 50% protonated (also 50% deprotonated). Overall, the pKas associated with oxaloacetate (pKa = 2.2, 3.9) are lower than those associated with malate (pKa = 3.4, 5.2). This means that as the pH goes down from 7 (i.e. becomes more acidic) and approaches the higher pKa of malate, malate reaches a pH where it has multiple populated protonation states but oxaloacetate does not. As a result of this effect, we find that lowering the pH (making the environment more acidic) makes the ΔrG’ more positive, favoring the reverse reaction even more. In other words, we need at least ≈54000 times more malate than oxaloacetate to make this reaction flow towards oxaloacetate spontaneously. A 5x104-fold difference is biologically plausibile, but we must remember that the previous reaction in the TCA cycle, the one that makes malate, must also be thermodynamically feasible for the TCA cycle to work. Forcing a very high malate concentration will strongly constrain the operation of the TCA cycle! One solution employed by some organisms is to use a different, higher potential quinone electron carrier (Noor et. al, 2014). This has the effect of increasing the intrinsic favorability of the reaction so that such extreme malate concentrations are not required. Since the quinone has a higher potential, however, less energy is released and less ATP can be formed when electrons carried by the quinone are ultimately donated to O2. Remember that the pH is a log base 10 scale, meaning that the 1.3 pH point difference between the higher pKa of malate and that of oxaloacetate indicates a very large difference more than 10-fold difference in the abundance of protonated carboxylic acid at pH 5.2.